Developing and nurturing the leadership talent in your firm is critical to your business success - in a down economy as much as in robust times. 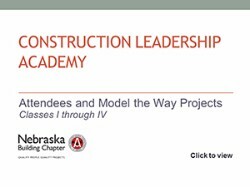 For that very reason the Nebraska Building Chapter is excited to announce the fourth Construction Leadership Academy. The Purpose of the Academy will be to develop the new and nurture the existing leaders in the industry through increasing their engagement and leadership skill set.